TPC Racing’s MOST POPULAR turbo kit for the 987 Cayman/Boxster will provide drivers with up to 460HP of shear exhilaration! Cayman owners have long dreamed of giving their cars the power they need to truly be the best they can be. The dreaming is now over with the release of the TPC Racing Stage II(S2) Cayman S Turbo Kit. Drivers can now experience mind bending acceleration that equals that of a 997Turbo. By pairing the immense acceleration of 997Turbo with the Cayman’s mid-engined agility, TPC Racing has created the ultimate driver’s car. After 22 months of R&D, our TPC Racing S2 Cayman S Turbo kit is now available to the public. With 460HP* on tap, the TPC Racing Cayman S Turbo will easily put you through the 1/4 mile in well under 12 seconds. During preliminary testing the TPC Racing test mule achieved a very respectable 11.7 second run @121mph; faster than a 997Turbo or a 997 GT3. However, with just a couple of TPC Racing’s optional upgrades, drivers can now achieve 1/4mile times that are right on the edge of 10 seconds with the potential to be even faster! That’s territory normally reserved for modified 997Turbo’s and big block American muscle. Combined with it’s excellently balanced chassis, the TPC Racing S2 Cayman S Turbo is well equipped to terrorize GT3s and Z06s at your next track day. This incredible package was developed with 150+ hours on the dyno, nearly 30,000 miles on the street, and 30+ track testing sessions, the TPC Racing Turbo s2 Cayman S Kit meets our strict standards for performance and earns our seal of approval! With an engine tuned to develop 460HP*, working in concert with an outstanding mid-engined platform; it is understandable why the TPC Racing Cayman S Turbo Kit is so highly coveted by Cayman owners. This system transforms the Porsche Cayman/Boxster from a fairly capable sports car, into a supercar killer. Porsche owners all have one thing in common; high expectations for their vehicle’s performance; and with the TPC Racing S2 Cayman S Turbo kit, their expectations have been matched and exceeded. 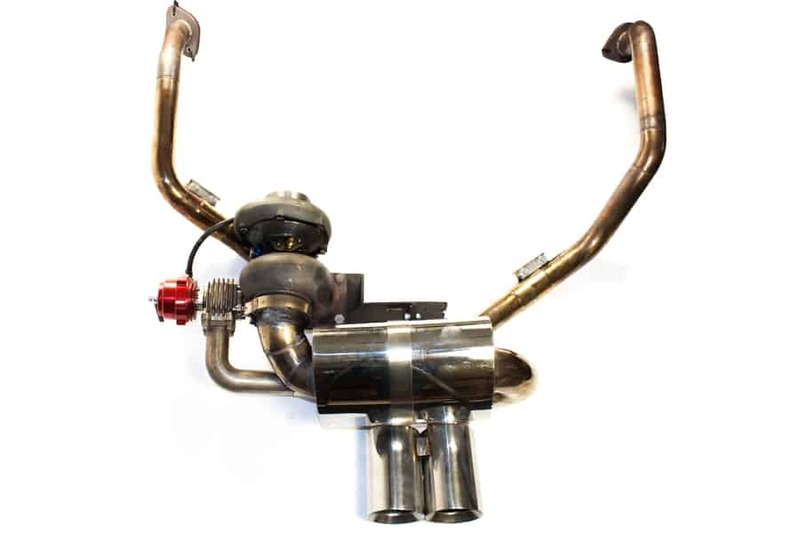 The TPC Racing S2 Cayman S Turbo Kit employs a single turbo setup. The turbocharger used was specially designed to provide maximum power with fast spooling. In this application we have harnessed this turbocharger’s mighty potential to force only 4.5lbs of boost into the stock Cayman S engine. Boost was restricted to 4.5lbs to preserve the motor’s reliability. Smooth operation and the vehicle’s longevity are two of our primary focuses when producing a forced induction kit. In order to cool the massive amount of compressed air being fed into the Cayman’s engine, TPC Racing employs a liquid-to-air intercooler setup for maximum efficiency and ultimate power. This system works in conjunction with the OEM front center mount radiator***. By designing a front radiator system that employs that OEM Porsche front radiator ducts and supports, we can ensure the the system maintains Porsche’s/TPC Racing’s high standards for fit and finish as well as ease of installation. All of these OEM components have been wind tunnel test by Porsche to guarantee the most efficient airflow possible; you cannot beat Porsche engineering! In addition, should any of these components ever be damaged or worn out from years of use, replacement pieces can easily be purchased at any local Porsche dealership! In order to move the coolant through the TPC Racing system, we turned to a stout and reliable Bosch coolant pump, the same pump used on the Ford GT and F150 Lightning. The pump size is carefully selected to move coolant at the most efficient rate; too fast and the coolant will pass through the radiator too quickly without transferring enough heat out of the coolant; too slow and the Intercooler will heat up because fresh cold coolant will take too long to circulate through the system. Positioning of the intercooler itself was a challenge, however the TPC Racing design places the intercooler in an area that will allow it to get ample cooling from the ambient airflow without being directly subjected to the muffler’s radiant heat. Whether you are facing hours of stop and go traffic, desert heat, or a weekend at the track; the liquid-to-air intercooler setup used in the TPC Racing S2 Cayman S Turbo Kit will effectively manage intake air temperatures. Planet-9’s Dr.BugKiller & Jaica test driving Dr.BK’s 2.7L Cayman Turbo in Puerto Rico! 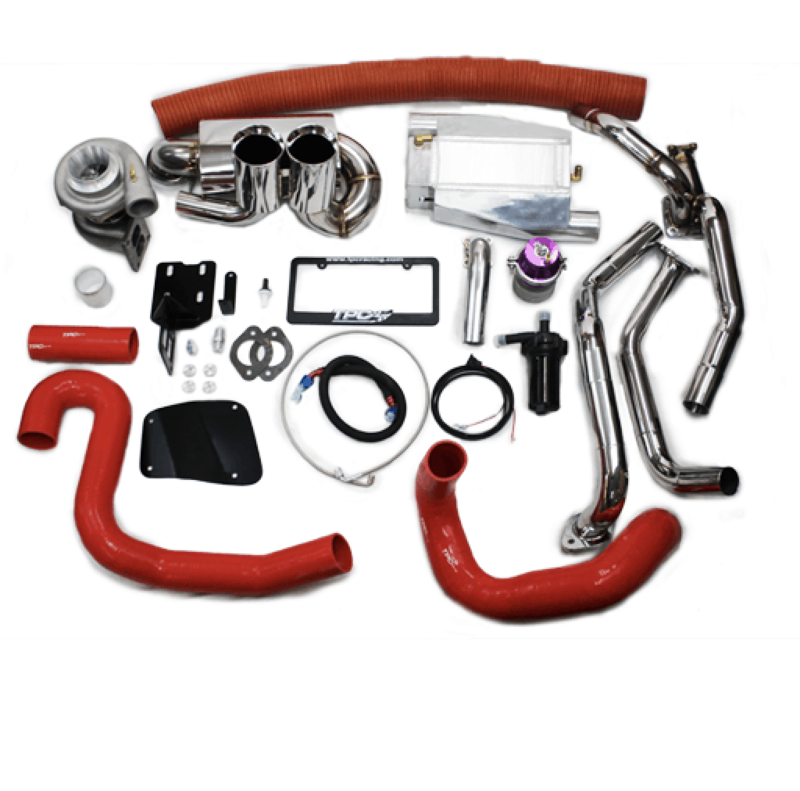 The TPC Racing S2 Cayman S Turbo Kit completely replaces the stock exhaust system excluding the exhaust manifolds/catalytic converters. The exhaust included the TPC Racing S2 Cayman S Turbo Kit produces a healthy rumble the will give you goosebumps. We went through many different designs during R&D to come up with a muffler setup that would produce an excellent tone while being perfect streetable. During normal driving conditions the exhaust maintains itself at a nice low rumble, but when the throttle is cracked open those around will know for sure that this is no ordinary Cayman. 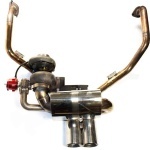 Made with aircraft grade stainless steel and polished to a shine, the exhaust in this kit provides an attractive and aggressive, sound and appearance with ZERO drone or resonance. One of the perpetual downfalls of aftermarket turbo/supercharger systems is their overall fit and finish, ease of installation and the everyday drivability of the vehicle. One such issue, common with aftermarket forced induction systems is their tendency to have lots of squeaks and rattles of parts rubbing and flexing and vibrating against other parts. This all leads to a car that may be fast, but is definitely not a pleasure to drive. In order to fight back against these annoyances, TPC Racing had the idea to create custom molded 5-layer silicone piping. These attractive pipes will produce absolutely ZERO squeaks or rattles to take away from the overall driving experience. And, because of the extreme flexibility of these silicone tubes, installation could not be more simple. They can be easily slid into position and be flexed to find a perfect fit. In addition, their extremely durable 5-layer construction ensures that they will be able to survive, without dents or breaks, for many years to come even if they take occasional impacts from small road debris. Just another way in which TPC Racing has gone above and beyond to create a system that is not only simple to install, but also requires virtually no maintenance! Combined with the TPC Racing S2 Cayman Turbo’s superb driving characteristics, you’d swear you were driving a factory turbocharged car. “To add, this car is my daily driver, it’s amazing, what is most amazing is that the car behaves as though it’s totally stock, no drama whatsoever, seriously, none. However, it pulls so well and is a flying machine. Considering the exhaust is not obviously stock, there is zero drone, my friend’s Boxster with a B***a is just awful to drive unless you’re stopped or going hard, in between it just gives you a headache, TPC exhaust, is admittedly, ‘louder’ than stock but not LOUD or intrusive. “I have to agree with everything Skinnywhite has said, it makes a great car greater! Chasing down cars that you’re not ‘supposed’ to, is a great feeling, admittedly when you chase a C63 AMG for 3 laps and he won’t move over it gets frustrating, but it’s part of what is to have a Cayman that looks stock, but doesn’t ‘act’ it. After passing the Merc he went backwards, the conversation later went something like this….. The priceless and usual reply…..
Are you a DIYer? Check out this customer performed installation. Here is another customer DIY installation of the TPCRacing Cayman S2 Turbo Kit. Check out what EVO MAGAZINE had to say about the TPCRacing Cayman Turbo. Customer David G’s Cayman Turbo, featured in the 2009 Eurotuner GP. This kit fits all 987 Cayman and Boxster models as well as all 986 Boxster models. LOOKING FOR MORE POWER? HOW ABOUT 500BHP? HOW ABOUT 600BHP? There are those drivers, that simply feel that a vehicle with only 460BHP is still unacceptably slow. For you braves souls, we have answers to your demands as well! The TPC Racing Stage III Cayman Turbo Package allows users to dial in over 500BHP, while the TPC Racing Stage IV Cayman Turbo System is rated over 600BHP! Want to build the ultimate trackday Cayman; the TPC Racing Stage IV Cayman Turbo? Check out TPC Racing’s completely custom built 3.7L Low Compression Cayman Turbo. Designed to maintain maximum power for the long haul, the TPC Racing 3.7L Low Compression Cayman Turbo can safely run higher boost levels than the standard kit producing what some would call a tidal wave of torque all the way across the RPMs. Not quite ready for Stage II? Just getting into the Porsche aftermarket, or modifying on a budget? Check out the TPC Racing Cayman/Boxster Stage 1 Turbo Kits. These non-intercooled turbo kits are the perfect building block for anyone just looking for moderate power for a street car, or for someone who wants to upgrade in the future! All TPC Racing Stage I Turbo Kits car be upgraded to the Stages at anytime. Watch as a TPC Racing Cayman Turbo is driven HARD on the track for over 20 minutes! While it’s on track, nothing is safe, as it passes 996Turbos, GT3s, BMWs, and one very unlucky GT3RS. TPC Racing Dealer/Installer AutoEdge Transforms a Stock Cayman S into a Trackday Beast with a TPC Racing Cayman S Turbo Kit and More! In order to provide adequate fueling for TPC Racing 987.1 Cayman/Boxster S Turbo Kit, the OEM injectors are replaced with uprated motorsports injectors. No other modifications to the fueling system is necessary. 4. What models Cayman/Boxster will this kit fit on? The TPC Racing Cayman/Boxster S Turbo Kit can be installed on ANY 987.1 model Cayman/Boxster. Models equipped with Tiptronic transmission will require modification of the transmission mounts as well as relocation of the transmission oil cooler. 5. I have a vehicle with a built/swapped motor; can this kit be installed? There are no other upgrades REQUIRED to handle the power of the Cayman/Boxster Turbo Kit. However, before installing any aftermarket high performance vehicle modification, you should make sure that all vehicle systems/components are in proper operating condition. The only component that can see increased wear because of the additional power is the clutch/disc/flywheel assembly. This is very dependent on the driving style of the vehicle owner. However, good condition factory units can withstand the added power of the turbo kit for standard street applications. When the OEM components do require replacement due to age/wear, we have both OEM and aftermarket upgrade options for the clutch and flywheel. While not necessary, we, at TPC Racing, also produce a long line of suspension/drivetrain/brake upgrades that will compliment your turbo setup, and help you to create s true budget supercar! As with all high performance vehicles, regular maintenance must be performed to help ensure the longevity and proper operation of all engine and turbo kit components. Oil changes must be performed every 3000miles, or once a year, whichever comes first. For those who drive more aggressively or use their vehicles on track, oil changes should be done more frequently based on how hard you drive. As with any aftermarket high performance engine modification, the TPC Racing Cayman/Boxster Turbo Kit will void your engine’s factory warranty. The rest of the vehicle will remain unaffected. * – All WHP(wheel horsepower) figures are determined using a Dynojet Research Inc., 224x RWD dynomometer. All BHP(crank/brake horsepower) figures are estimated. *** Purchase of front center mount radiator is required for all MANUAL TRANSMISSION vehicles. Vehicles equipped with the TIPTRONIC TRANSMISSION already have the radiator installed from the factory. **** All vehicles with Tiptronic transmission require modification of the transmission mounting brackets as well as relocation of the Tiptronic transmission oil cooler. Combined with it’s excellently balanced chassis, the TPC Racing S2 Cayman S Turbo is well equiped to terrorize GT3s and Z06s at your next track day. This incredible package was developed with 150+ hours on the dyno, nearly 30,000 miles on the street, and 30+ track testing sessions, the TPC Racing Turbo s2 Cayman S Kit meets our strict standards for performance and earns our seal of approval! With an engine tuned to develop 460HP*, working in concert with an outstanding mid-engined platform; it is understandable why the TPC Racing Cayman S Turbo Kit is so highly coveted by Cayman owners. This system transforms the Porsche Cayman/Boxster from a fairly capable sportscar, into a supercar killer. Porsche owners all have one thing in common; high expectations for their vehicle’s performance; and with the TPC Racing S2 Cayman S Turbo kit, their expectations have been matched and exceeded. In order to cool the massive amount of compressed air being fed into the Cayman’s engine, TPC Racing employs a liquid-to-air intercooler setup for maximum efficiency and ultimate power. This system works in conjuction with the OEM front center mount radiator***. By designing a front radatior system that employs that OEM Porsche front radiator ducts and supports, we can ensure the the system maintains Porsche’s/TPC Racing’s high standards for fit and finish as well as ease of installation. All of these OEM components have been wind tunnel test by Porsche to guarantee the most efficient airflow possible; you cannot beat Porsche engineering! In addition, should any of these components ever be damaged or worn out from years of use, replacement pieces can easily be purchased at any local Porsche dealership! In order to move the coolant through the TPC Racing system, we turned to a stout and reliable Bosch coolant pump, the same pump used on the Ford GT and F150 Lightning. The pump size is carefully selected to move coolant at the most efficient rate; too fast and the coolant will pass through the radiaotor too quickly without transfering enough heat out of the coolant; too slow and the Intercooler will heat up because fresh cold coolant will take too long to circulate through the system. Positioning of the intercooler itself was a challenge, however the TPC Racing design places the intercooler in an area that will allow it to get ample cooling from the ambient airflow without being directly subjected to the muffler’s radiant heat. Whether you are facing hours of stop and go traffic, desert heat, or a weekend at the track; the liquid-to-air intercooler setup used in the TPC Racing S2 Cayman S Turbo Kit will effectively manage intake air temperatures. One of the perpetual downfalls of aftermarket turbo/supercharger systems is their overall fit and finish, ease of installation and the everyday drivability of the vehicle. One such issue, common with aftermarket forced induction systems is their tendency to have lots of sqeaks and rattles of parts rubbing and flexing and vibrating against other parts. This all leads to a car that may be fast, but is definitely not a pleasure to drive. In order to fight back against these annoyances, TPC Racing had the idea to create custom molded 5-layer silicone piping. These attractive pipes will produce absolutely ZERO squeaks or rattles to take away from the overall driving experience. And, because of the extreme flexibility of these silicone tubes, installation could not be more simple. They can be easily slid into position and be flexed to find a perfect fit. In addition, their extremely durable 5-layer construction ensures that they will be able to survive, without dents or breaks, for many years to come even if they take occasional impacts from small road debris. Just another way in which TPC Racing has gone above and beyond to create a system that is not only simple to install, but also requires virtually no maintenance! Combined with the TPC Racing S2 Cayman Turbo’s superb driving characteristics, you’d swear you were driving a factory turbocharged car.